You meet Homo neanderthalensis in a dark alley……………….What do you do? Homo neanderthalensis is one of the best understood species of hominin today. One that lasted many hundreds of thousands of years throughout Europe. Despite what we know through the lens of science, there is still much that we want to know about this species of human. Interrogating the subtle pieces of evidence is the task of palaeoanthropologists, archaeologists, palaeoenvironmental scientists throughout the world. Contrary to what you may see on your average human evolution documentary, the kind of research conducted can be much more subtle. Here I will draw your attention to a difficult question. If we could fill the Great Hall of the South Kensington Museum with a few hundred individuals of our extinct cousin, what differences would we see in the upper chest and neck. The answer to that, at the beginning of 2015: We are not happy that we really know enough to give an answer. H. neanderthalensis is a well represented species of human in the fossil record, but the post-cranial anatomy is less well accounted for than the skulls. Not ideal for an investigation into the chest and abdominal regions of the human body. Nevertheless, it is vital we exhaustively examine what we have, to reveal potential clues to the kind of morphology these populations once exhibited. To that end, ten palaeobiologists from various Spanish academic institutions presented evidence that may be useful here. The mechanics of the breathing system, constrained by the rib cage and not the evolution of the species, is the focus here. Research continues to be a work in progress, new technologies arrive and they help further our understanding of the past. This research is no exception. Two year into the new millennium a new form of analysis that gauged quantity within a structure was applied to a collection of isolated ribs from an individual codenamed Shanidar 3. This individual had a more splayed lower rib cage compared to the more barrel-like form of our lower rib cage. Thus started a series of papers that suggested the lower rib cage of Homo neanderthalensis was generally less like ours. Comparatively less investigative research has been given to the upper end of the rib cage. This latest academic paper sets out to help understand just that. In 1906 and a time when ancient humans were Anti or Post Diluvian Era (Noah’s Great Flood), Dragutin Gorjanović-Kramberger suggested that the superior ribs are an important facet of an upper thoracic orchestra of components, that together control upper thoracic breathing, separate from diaphragmatic breathing. It was not until 2015 that this hypothesis was put to the test on six hominin first-ribs from the cave site of El Sidrón, Asturias, northern Spain. The six first-rib fragments may represent, at most, four individuals. The first step was to identify the bone fragments and place them in their correct anatomical position. Below is a re-organisation of the information given about the sample itself. The first-rib of Kebara 2 was found to be similar in shape space and form space (both terms used in a statistical analysis of shape, known as Procrustes Least Squares (PLS)) to SD-1767 and SD-1699, indeed H. neanderthalensis exhibits straighter first-ribs than modern day Homo sapiens. What could this mean? The scalene muscles are the ones that give your neck, its shape. They run from the Rib 1 and Rib 2 up the side of your neck attaching to the vertebrae. Alteration in shape of the first ribs, and the attached muscles will have to operate differently, but may help explain the differences we see between H. sapiens and H. neanderthalensis. The principle component analysis (PCA) reveals some overlap in the linearity of the rib shaft. Such results are reflected in analysis of the specimens of Krapina Cave, Croatia and ATD6-108 representing Homo antecessor, from Gran Dolina Cave, Atapuerca, Spain. So, the straightness of the first-ribs may affect the movement of the upper torso during breathing. Looking at the juveniles, it is important to understand costal cartilage development. Understanding adult H. neanderthalensis individuals is easier, as there are more post-cranial fossils, but the El Sidrón hominins will be useful in understanding the ontogeny of costal cartilage in future fossil ribs of juveniles. The El Sidrón juveniles confirm a tighter upper chest for H. neanderthalensis. The first-ribs are smaller, but feature larger attachments at the rib heads, whereas the lower ribs have smaller attachment points. Therefore, a H. neanderthalensis individual, exhibited a smaller upper torso, which was further from the cranium thanks to the slightly longer neck vertebrae. First-ribs that are straighter would have to project out from the skeleton more and Gorjanović-Kramberger proposed that the rest of the rib-cage would project outward, just as much. The scientific team added to this, that a change in the first ribs would in turn affect the rest of the rib-cage, because the ribs are latched together with intercostal muscle, preventing individual ribs from varying in shape, that ultimately allows coordination of muscle, chest wall and breathing action. Upper ribs connect directly with the sternum and so, result in distinctive rib shape compared with the lower thorax. To summarise, the first ribs appear to determine the shape of the upper thorax ribs, but straightness of the first rib is linked with the straightness of the upper ribs. Together, this suggests the existence of different rib shape and functions between the upper and lower thorax. When you look at a particular fossil specimen, it is important you are aware of what bones, muscles, cartilage was associated with it. They all interact in subtle ways which we are piecing together in hominins, with the variety in body forms available going back 7 million years. In examination of the monophyly of Paranthropus, cladistical statistics showed us that the skeletal points used, should not be linked with eachother. An example of that, would be the masticatory system in Paranthropus comprising numerous points, all interacting with one another. This is a shame because the crania and mandibles are predominantly all we have of that genus. Currently, most are happy that Paranthropus boisei, Paranthropus aethiopicus and Paranthropus robustus are part of the same family – they are monophyletic. 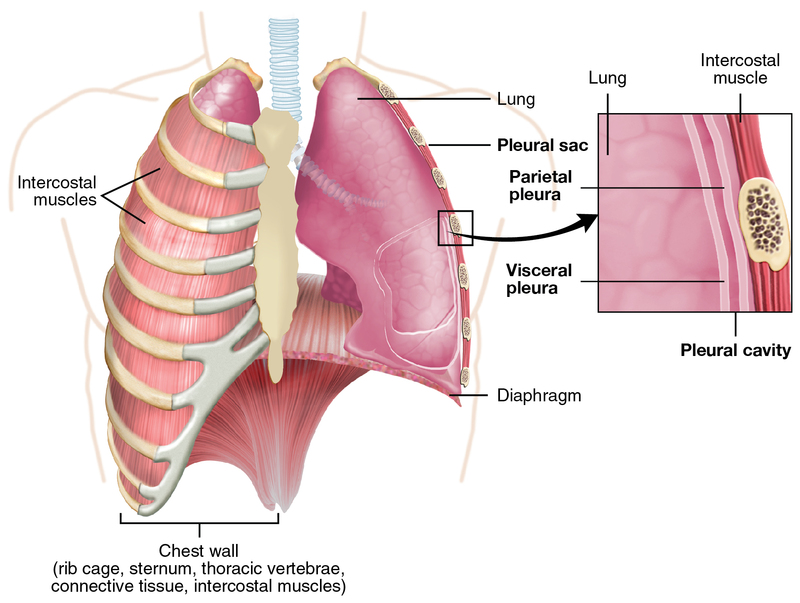 The rib cage, is similar to the masticatory system but it is a single unit with two functions, one is upper thoracic respiration and the other is diaphragmatic respiration. H. neanderthalensis evolved a more restrictive respiratory system and highly developed arm muscles, evolutionarily more important for the condition in which it lived. So, if you were to meet our ancient ancestor in a dark alley, what should you do? It would have been prone to breathlessness, but could rearrange your face easier. Moral of the story, RUN!